Keep everyone safe during the cold weather months with the proper fire systems in place. Here, in the Mid-Atlantic, cold weather and frigid temperatures are nothing new. As winter quickly approaches, ensuring that your commercial water-based fire systems are working correctly becomes integral. As the temperatures continue to drop, the potential risk of your pipes freezing increases significantly. Building owners who have water-based fire suppression systems should really take cold weather precautions to keep themselves and all their occupants safe. After the first time you turn the heat on in your building, you should conduct tests on all water-based fire systems. In fact, areas with smoke detectors, the fire detection system should actually be turned off. This way, all the accumulated dust can quickly burn off without setting off a fire alarm. 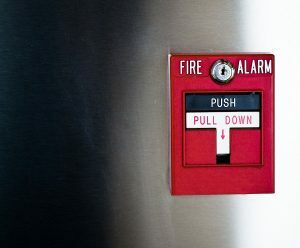 Because the worst case scenario is that the fire alarm goes off, simultaneously setting off various sensitive electrical or data rooms where gaseous fire suppression systems could potentially discharge. When winter weather strikes, you want your fire systems working correctly. As a result, all building owners need to make sure that their ambient heaters and heat tracing used for all their fire protection equipment is operating for the impending cold weather. One crucial thing that every building owner must do as the winter weather approaches are to check to make sure that the integrity of the pipes within the building is intact. If there are any issues with the piping or equipment insulation, contacting a professional as soon as possible becomes imperative to solve the problem efficiently. Another thing that business owners will need to do for the winter weather ahead is to notice any residual water discharge. Troubleshooting areas where condensation or residual discharge water may have already accumulated on low point drains can provide a much safer environment for all occupants. Before opening any drain valves, business owners with pre-action or deluge pilot systems need to be mindful of any residual water or condensation that could wreak havoc on the dry pipes. The result could be very disastrous if it’s not taken care of. If you are a business or building owner but unsure about how to properly check for these types of things, get a professional to help you out! This entry was posted on Wednesday, December 6th, 2017 at 11:16 am. Both comments and pings are currently closed.